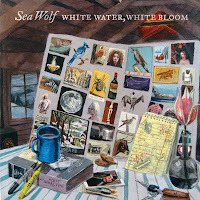 Atlas and the Anchor: Sea Wolf - "White Water, White Bloom"
Sea Wolf - "White Water, White Bloom"
Sea Wolf, Alex Brown Church’s project returns, this time with a full band and a more grandiose and ambitious effort for their second album, White Water, White Bloom. Out now on Dangerbird Records, the album is autumnal, vivid in its lyrical weight and floats between orchestral folk and guitar-led indie-rock. “Wicked Blood” opens the album with on a swell of strings, chiming piano and Alex’s descriptive poetic lyrics about a beautiful temptress. “Dew in the Grass” is cinematic with lush orchestration providing the song’s main melody and stabbing electric guitar adding atmospheric accents. The chugging strings match the emotion in the yearning vocals on “Orion & Dog”, adding more substance to one of the albums more sparse, acoustic moments. The guitar driven “O Maria!” is charging, off kilter, and reminiscent of Wolf Parade with a clever arrangement including pounding piano and a stomping beat. Like much of the album, the title track, “White Water, White Bloom” sounds both modern and from a different era. Alex enlisted Mike Mogis as producer/instrumentalist to help bring his homespun melodies and organic instrumentation to life. “The Orchard” is a hauntingly beautiful mid-tempo ballad with a lush but not dense atmosphere of orchestration. “The Traitor” begins with plinking piano and dueling guitars and violins but is one of the more up-tempo, rocking songs on the album. Album closer, “Winter’s Heir” features bellowing vintage organs, steady acoustic strumming and crisp electric guitar lines that weave in and out of the cozy, folksy arrangement. Sea Wolf has easily avoided the “sophomore slump” by raising the bar with the new dynamics and expanded arrangements gained from the full band experience on White Water, White Bloom, making for an engaging and fulfilling listen from start to finish. Monsters Of Folk - "Monsters Of Folk"
Dappled Cities - "Zounds" and album giveaway! Vandaveer - "Divide & Conquer"